Learning Radiology: Recognizing the Basics, 2nd Edition, is an image-filled, practical, and clinical introduction to this integral part of the diagnostic process. William Herring, MD, a skilled radiology teacher, masterfully covers everything you need to know to effectively interpret medical images. Learn the latest on ultrasound, MRI, CT, and more, in a time-friendly format with brief, bulleted text and abundant high-quality images. Then ensure your mastery of the material with additional online content, bonus images, and self-assessment exercises at www.studentconsult.com. Quickly grasp the fundamentals you need to know through easy-access bulleted text and more than 700 images. Learn from the best, as Dr. 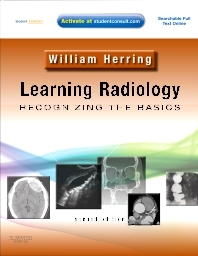 Herring is both a skilled radiology teacher and the host of his own specialty website, www.learningradiology.com.